Portrait by Ilya Repin, 1887. Alexander Konstantinovich Glazunov (Russian: Александр Константинович Глазунов, Aleksandr Konstantinovič Glazunov; French: Glazounov; Template:Lang-ger; August 10, 1865 – March 21, 1936) was a major Russian composer, as well as an influential music teacher. His music linked his Russian compositions, and gave rise to nationalism and pride in Russian culture. His style of composing gained international recognition for his symphonies, tone poems, elegies, ballets, chamber music, choral works and concertos. He composed more than 100 pieces of music many of which endure to the present age. Glazunov was born in St Petersburg. He studied music privately under Nikolai Rimsky-Korsakov. The first of his nine symphonies premiered in 1882 when Glazunov was 16 years old. His popular Stenka Razin was also a youthful work. Glazunov also wrote three ballets. 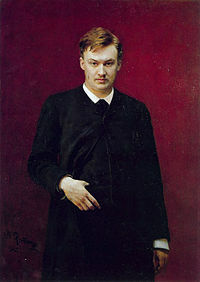 In 1899, Glazunov became a professor at the Saint Petersburg School of Music, and later its director. Glazunov left Russia in 1928. He toured Europe and the United States, and died in Paris. He came to be acknowledged as a great prodigy in his field, and with the help of his mentor and friend Rimsky-Korsakov, completed some of Alexander Borodin's great works, the most famous being the opera Prince Igor, including the popular Polovetsian Dances. For Shostakovich's impressions and interaction with Glazunov, see Solomon Volkov's Testimony: The Memoirs of Dmitri Shostakovitch, 25th Anniversary ed., Limelight editions, New York, 2004. Alexander Glazunov, first known as the "Little Glinka," became famous in his own right as a composer and teacher. His music linked his Russian compositions, which gave rise to much nationalism and pride in Russian culture, to those of a set European style of composing giving international recognition to his symphonies, tone poems, ballets, chamber music, choral works and concertos. His prolific abilities brought more than 100 separate pieces of music into existence. ↑ (  Chamber Music Sundaes with Listings with details about opp. 105 and 106) Retrieved September 20, 2007. This page was last modified on 9 November 2016, at 20:22.